Jesus—Our Justice and Peace. When peace theologians and church leaders taught me to read and interpret the Bible through the life, character, and work of Jesus, I felt so liberated! Being raised up in the midst of the violent context under the dark years of Marcos’ martial rule in the Philippines, my violent tendencies began to heal as I re-read the Word through the person of Jesus in the Gospels. The life, character, work, and teachings of Jesus ignited a transformation process in my life, in my marriage, in my family, in my understanding of community, and in what I might humbly contribute for the good of our land, our people, and the rest of humanity. Out of this process and through this transformation journey, a peacebuilding community and an inclusive development advocacy were born as Joji and I seek to follow Jesus of Nazareth. 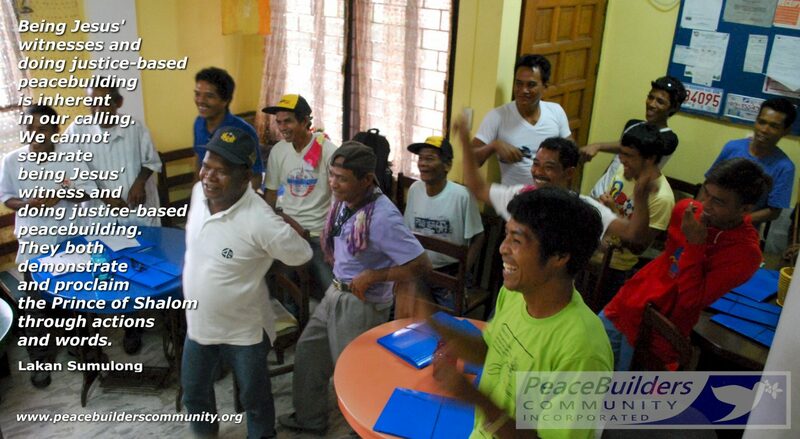 Christian farmers from an armed-conflicted area in Southern Philipiines learn Christ-centered justice and peace advocacy at PeaceBuilders Community Centre. They are expected to help in a long-term, community-based peace and reconciliation processes between pro-government and anti-government parties-in-conflict. CFP Photo. With so many philosophical, spiritual, and religious frameworks in the ‘cosmos’ of peace and justice advocacy, Joji and I were prompted to search deep in our hearts with regards to the ultimate source of our energies that would sustain the peacebuilding and inclusive development tasks we were called to do. It became clear to us. Our justice-based peacebuilding advocacy is centered on Jesus, who is Shalom personified! Jesus, the Prince of Shalom, is the center of the Good News (euanggelion). From the New Testament perspective, it is absurd to talk about “witnessing to the world” without “peacemaking in the world.” Our understanding of biblical peace is based on the unequivocal declaration that Jesus Christ is the center of life and reality, and that Christ brings the whole creation intact! :: Harmony with the creation (economic-ecological transformation). Sihaya Ansibod, Values Training Technician of Coffee For Peace (wearing black shirt, middle) and Tala Alngag Bautista, Senior Vice President of Coffee For Peace (blue shirt, middle) meet with community leaders in one of the armed-conflicted areas in Southern Philippines. Both Sihaya and Tala belong to the Indigenous People in the Philippines. They are part of the next generation leaders at PBCI and CFP. CFP Photo. Being Martyr-Witnesses for Jesus. Being Jesus’ witnesses and doing justice-based peacebuilding is inherent in our calling. We cannot separate being Jesus’ witness and doing justice-based peacebuilding. They both demonstrate and proclaim the Prince of Shalom through actions and words. We are both energized and overwhelmed by our understanding of “being Jesus’ witness”. We learned that the term “witness” comes from the New Testament word martyría — that is, martyr-witness. This is not about having a messianic complex. This is not about mere adventurism in a place of danger. This is not a search for an extreme religious experience. This has been the discipleship legacy of the followers of Jesus in the past 2000+ years. This is the kind of discipleship we need in our beautiful, but conflicted, land. This is the kind of witness we need in our globalizing and conflicted world. Being martyr-witnesses, first of all, means that we will love all people unconditionally and we will practice selfless love to the point of offering our lives to the people with whom we are called to live and to serve. This is exemplified in the humble life of Jesus of Nazareth whom we follow in response to His sacrificial love. Secondly, it means that, by God’s grace, we will not lie. As witnesses to the truth we have experienced in Jesus Christ, we will initiate transparent and honest interaction with all the people concerned as we relate with them and as we formulate and implement our organizational policies. Thirdly, being martyr-witnesses affirm that Justice is an attribute of God. As justice is an attribute of God, our tasks will be implemented in accordance with what is just and equitable among all people concerned. We will listen to, and suffer with, those who have been oppressed because of historical injustice. Because of the redemptive nature of Jesus’ Way, we will act justly as we peacefully seek the healing of the nations from all forms of injustice. Finally, it means incarnating God’s peace in our lives. We will seek harmony and reconciliation with the Creator, with our being, with others, and with the creation. We believe in solving problems through non-violence. By God’s grace and mercy, we will not use weapons to hurt or to kill people as a means to accomplish our dreams, mission, and objectives. We have been applying these witness-principles in our peacebuilding field operations since 2006. This file video — taken by Gerd Bartel during the height of the 2008 armed conflict around Ligawasan Marsh in Central Mindanao — illustrates our desire to understand those outside our Christian community based on these theological-ethical values. May we, who profess to follow Jesus of Nazareth, demonstrate what it means to be true witnesses to his character — through our life of justice and peace.